This 22-day round trip from Vancouver includes a ride on the Rocky Mountaineer in GoldLeaf, a visit to Whistler, Banff & Jasper and a luxury Alaskan Cruise. Things don’t get much greater than the Rocky Mountains, which tower over northwestern America. Although, as you’ll soon discover, everything in this part of the world is monumental in scale. Wind your way through the Rocky Mountains by train, admiring local wildlife and the immense firs that grace the route, before venturing into Alaska’s mighty fjords. This is a part of the world that’s as vast as it is beautiful. Gigantic glaciers, expansive plains, peaks that will take your breath away and predators that inspire awe – there’s nothing small about the great American North, or about the impression it will leave on you. Welcome to cosmopolitan Vancouver where your journey of wonder begins. For the next two night’s you will be exclusively accommodated at the Fairmont Hotel Vancouver. Celebrate tonight with a welcome dinner and toast to the adventures awaiting you and your fellow travellers. A sightseeing tour will showcase Vancouver’s hidden treasures. Choose to ascend Sulphur Mountain on the Banff Gondola for awe-inspiring views of Bow Valley or take a helicopter flight over the Three Sisters Peaks. Alternatively, enjoy a Bow River float trip, take a guided nature hike, rejuvenate in relaxing mineral pools, play nine holes of golf or head into the mountains by wagon for a cowboy cookout lunch. In July, there is also the option for a day trip to the famous Calgary Stampede. Whichever activity you choose, you’re sure to be swept away by Banff National Park, the first national park established in Canada and a World Heritage-listed Site. Don your leathers and hit the open road in a Harley Davidson™ sidecar or, if you prefer an aquatic adventure, go rafting down the Athabasca River or boating on Maligne Lake. Alternatively, take a scenic drive around Jasper’s stunning lakes and explore Maligne Canyon or rise above it all and take in the magnificent views on the Jasper SkyTram. Arrive into the alpine village of Sun Peaks, staying at the Sun Peaks Grand Hotel. This evening, learn about Canadian history in the most enjoyable way possible, with your presenter portraying himself as ‘voyageur’. It’s sure to leave a lasting impression. Whistler is an outdoor adventure playground and today you get to choose how to make the most of it. Enjoy the view by Zipline or Peak 2 Peak Gondola, take a mountain adventure tour or a thrilling jet boat ride. Stroll through beautiful Butchart Gardens. a scenic floatplane flight, horse and carriage ride or indulge in afternoon tea at The Fairmont Empress. Join your Cruise Director for a luxurious seven night Alaskan voyage on board Holland America Line’s ms Nieuw Amsterdam in a Verandah Stateroom. For the duration of your cruise, the ‘Signature Beverage Package’ has been included. Celebrate your first day at sea with a festive lunch, then settle back and relax with a book or explore the ship’s facilities, restaurants and lounges. Alaska’s charming state capital is only accessible by air or sea, so you can explore knowing you’ll never get lost. Take a stroll into the past. Historic shop facades, wooden boardwalks and echoes of the gold rush typify Skagway, the gateway of the Klondike Gold Rush. A National Park Service Ranger will interpret the natural wonders you are sure to see in this spectacular area. Alaska’s last port of call is Ketchikan, known as the ‘salmon capital of the world’. Be sure to sample some fresh local fare while you’re in town. Continue cruising south. Celebrate your Canadian and Alaskan escapade with a farewell reception. Arrive in Vancouver for your onward or homeward bound journey (please book flight to depart after 2pm). If your international flight departs after 5pm, take advantage of our hospitality lounge at the Fairmont Hotel Vancouver. We’ll be sorry to say goodbye after a wonderful journey. Experience the best of Canada and Alaska before ending with a two night stay in Boston. 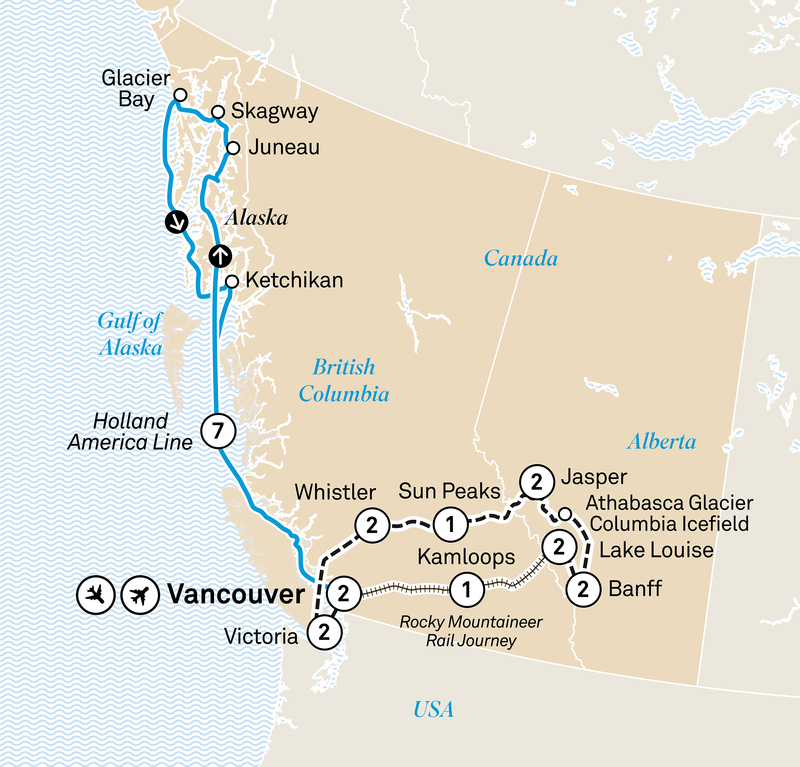 Cruise the Inside Passage of Alaska and ride the Rocky Mountaineer.